In GTA 5, you can travel around the streets as a werewolf (The Beast). This beast looks like the Teen Wolf in the fantasy comedy film (1985). Before you can play the werewolf, you must unlock it first. This is a bit difficult and requires the help of Bigfoot. 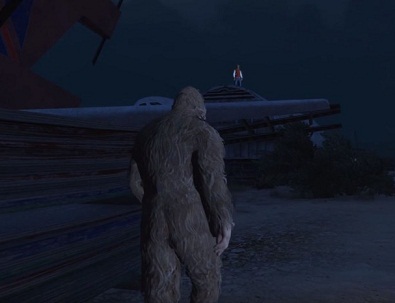 In our guide below we show you all steps to become the Teen Wolf in GTA 5. The search for the beast in GTA 5 begins with the search for the golden peyote plants. These are found in seven different locations in San Andreas 5:30 to 8:00 AM. It is also important that the weather is snowy or foggy. - Collect golden Peyote for Bigfoot every weekday from Sunday to Saturday. - You spawn as Bigfoot next to a dead animal or NPC, later next to a rabbit, etc., until you spawn next to the hunters from the quest "The Last One". - As Bigfoot you can make sounds using (Ctrl on keyboard or L3 on the controller) and receive answers from the Teen Wolf from afar a growling deep sounds. - Follow the growling, which leads you to a peyote plant. These have to collect. The following video will help you to find all of these plants. Once you have collected the last plant, you are allowed to transform into Bigfoot quit under any circumstances. On the contrary: Give your further sounds of you and follow the growl of the werewolf. You see on your way several victims and need to follow the footsteps of the beast until you have arrived at the airplane graveyard "Thomson Scrapyard". At this point, you will finally find the Teen Wolf and must defeat him in your Bigfoot form.